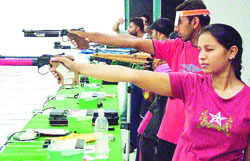 It was a day of celebrations at the local PAP indoor shooting range with India winning the first ever individual gold medal in the Olympics’ history, at the ongoing games in Beijing. The State Consumer Disputes Redressal Commission has dismissed the appeals filed by the LIC against an order of the district forum regarding payment of claims to a widow whose husband died on the railway track near the PAP flyover here more than seven years back. The town planning section of the municipal corporation today carried out a demolition drive against its defaulters. Inhabitants of local Balbir Colony, led by their president Rajesh Kumar, staged a dharna and blocked traffic for about an hour at the old Kanak Mandi Chowk today in protest against an order to demolish their unauthorised houses built on a 3 kanal 14 marla land owned by Ram Piari, widow of Gian Chand, in their colony. An open talk with the Sangharsh Samiti is the key to bring peace in Jammu & Kashmir (J&K). Agitated over the central government’s failure to resolve the Amarnath land row, Shiv Sena’s youth wing started fast unto death here on Monday. Youth wing of the SAD (1920) will be reorganised within a month to strengthen the party and to prepare it for the Lok Sabha polls. This was stated by the patron of the youth wing of SAD (1920) Hardev Singh Konsal while addressing a meeting of youths here today. No sooner had Abhinav Bindra won the gold medal in the 10 meter air rifle category, that the members of the PAP shooting range started sending congratulatory messages to each other. With this win, India too entered the medal tally. SP Rakesh Kaushal said Abhinav brought laurels not only to the country but the game as well. “Till date many people are not even aware of shooting as a game. At least now this individual sport would be widely recognised,” he said, adding that his victory would motivate other budding shooters in the country as well. He added that this is an upcoming sport in India and it actually required a boost. The grand victory will definitely help in giving a facelift to the game. It is pertinent to mention here that last time India made a name for itself in the 2004 Athens Olympics with the silver medal won by Rajyavardhan Singh Rathore. While the Punjab government declared a cash prize of Rs 1 crore, city-based Gold Gym too declared an amount of Rs 10 lakh for Abhinav. Meanwhile, local bodies minister Manoranjan Kalia also sent a congratulatory message to Bindra’s family. Sansarpur-based Unita Bansal’s husband had insured his life for a sum of Rs 3 lakh with accident benefit on July 8, 2001 and another Rs 2 lakh on July 18, 2001. He died just a few days later on July 28, 2001. He already had a policy of Rs 50,000 in 1996 which had lapsed and was revived on October 14, 1999. In its appeal, the LIC officials had claimed that deceased Sushil Kumar had an annual income of Rs 70,000 per annum and he could not have afforded so many life insurance policies by making payment of such a huge amount as premium. They pleaded that Sushil Kumar’s death had not occurred by accident but it was a case of suicide while alleging that there was an intention of fraud on the part of the insured. The commission,however, found that the LIC officials could not produce any documents to prove that the deceased had committed suicide. It also observed that Sushil was already insured in 1996 and from the fact that he had taken two policies a few days before his death, it could not be presumed that he had secured his policies with an intention to commit a fraud. Dismissing the three appeals of the LIC with costs of Rs 5,000 each, the commission also disposed off the appeals filed by the widow for enhancement of the rate of interest of 6 per cent awarded by the forum. “We do not find the interest rate to be extremely low. The respondent, however, would be entitled to all the benefits as per the insurance policies which Sushil Kumar was holding at the time of death,” the commission ruled. The MC team partly demolished three houses that had come up as a part of an unapproved colony near the KGF Palace in the basti area. The team led by municipal town planner MD Sharma also partly damaged the frontal portion of Kumar Hotel in Central Town that should have been left for parking. The team damaged a part of the unauthorised top floor. 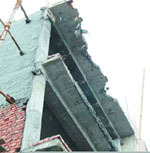 A part of the fifth floor of the building housing Raju Juice Corner in front of the Nehru Garden was also damaged since it was being constructed in an illegal manner. Ram Piari had filed a suit against the unauthorised houses constructed on her land Khasra no. 763 / 424 (1-0, 456/426 - 42, 3-14), which a civil judge of senior division, S.S. Sahni, had ordered to demolish in a judgement passed on August 11.Rajesh Kumar said they had constructed houses in the said land about 25 years ago. “If the construction of the houses was illegal, why did the food and civil supply department issue us ration cards and PSEB and municipal council provided us electric and water connections. The election commission has also issued us photo identity cards on the addresses of the houses situated in the said colony,” said Rajesh Kumar. In case the houses are demolished, all the inhabitants would immolate themselves against the attitude of the district administration, he threatened. Later, they met SDM, Hoshiarpur, Karnail Singh who assured them a case of land allotment, after acquiring the said land, would be prepared and sent to the state government for final allotment to them. In a press release issued here, chief of Akhil Bharatiya Vidyarthi Parishad (ABVP) Manu Sharma and a senior student leader Bhanu Sharma demanded that the Centre should initiate dialogue with an open mind and reverse its controversial decision to withdraw the land allotment to the Amarnath Shrine Board (ASB). The success of the democratic process depends upon the sensitivity of the central government. A negotiated settlement is possible only if the government shows its readiness to correct its mistakes. The ABVP is of the opinion that the situation will normalise soon, provided the government adopts a pragmatic position that redresses the core grievances of the people. “The people of the Jammu region and elsewhere in the country have started to believe that the government, which buckled under the pressure from the separatists from the Valley, is now adamant in ignoring the sentiments of the people of Jammu,” claimed the duo. The ABVP reiterates its stand that direct talks, revoking the decision on the land issue and recalling the governor of J&K will solve the problem. They said a false impression has been created by separatists that if land is allotted to the ASB, it will erect permanent structures and ensure Hindu settlement and will change the demography of the state. Office bearers of the youth wing would start meetings with all the district wing presidents in state from August 14 to get the recommendations for proposed presidents and other office bearers in their respective districts. After considering candidatures, a list would be prepared and would be submitted to their national president Ravi Inder Singh who would later make the announcement of all the office bearers of the district unit of Punjab. Youth wing national president Paramjit Singh said a campaign would be launched against drug abuse in the state after strengthening the organisation.